"NY-17" redirects here. NY-17 may also refer to New York State Route 17. 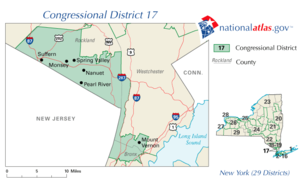 New York 's 17th congressional district - since January 3, 2013. New York's 17th Congressional District is a congressional district for the United States House of Representatives located in Southern New York. It includes all of Rockland County, and portions of central and northwestern Westchester County, including the city of White Plains and the Tappan Zee Bridge. The district is currently represented by Democrat Nita Lowey. From 2003-2013, the 17th district encompassed portions of the Bronx, Westchester County, and Rockland County. It included the neighborhoods of Norwood, Riverdale, Wakefield, Williamsbridge, and Woodlawn in the Bronx, the city of Mount Vernon and parts of Yonkers in Westchester, as well as Monsey, Nanuet, Pearl River, and Suffern in Rockland County. Parts of Bronx, Rockland, Westchester. Various New York districts have been numbered "17" over the years, including areas in New York City and various parts of upstate New York. The District was historically the East Side Manhattan district. In the 1970s it was a Staten Island seat. It became the west side Manhattan seat in the 1980s. It became a Bronx-based seat in the 1992 remap and was shifted north into Rockland county in 2002 to absorb terrain from the deconstruction of the old 20th District. Previously the 19th District covered much of the Bronx portion of the seat in the 1980s; while in the 1970s the 23rd District covered most of this area. March 3, 1807 Elected in 1804. Re-elected in 1814 but did not take or claim the seat. March 3, 1817 Successfully contested Smith's election. March 3, 1825 Redistricted from 11th district. From 1833 to 1843, two seats were apportioned to the 17th district, elected at-large on a general ticket.